To better organize our day, and through the power of the iPad, we divide up our personal, general work, team time off and large clients into separate calendars. This used to cause issues trying to watch multiple calendars and make sure there wasn’t conflicts, now you can choose which or all to view through a single interface. Adding and editing appointments across multiple calendars all through a single interface is also nice. There are a few calendar options that we have tested/reviewed. Generally, they are in the area of viewing a day like gantt chart. One newer option, Agenda Calendar, is quickly becoming popular due to it’s simplistic views. The universal app offers all the feature and functions one needs behind the scenes, and many day/week/month viewing options, yet it shows your information with lots of white space so you see what you need without cuteness or clutter. Agenda Calendar, surprising that it is only 99 cents, pulls in appointments from your iPad built-in calendars, Google calendar and even any Outlook calendars you may be using. View one or all as you need. 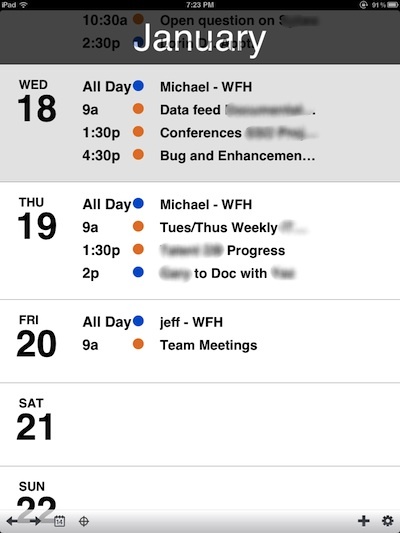 We were unable to find any team member’s calendar view that didn’t have a lot of confidential company appointments listed so excuse our heavy use of blurring out info in the below screen shots. The hope is you get the idea of the usability and look past our adjustments. We won’t mention the name of the team member who has such a light schedule. In portrait view, Agenda Calendar starts with your list of your week which you can sweep through to show upcoming and past week. 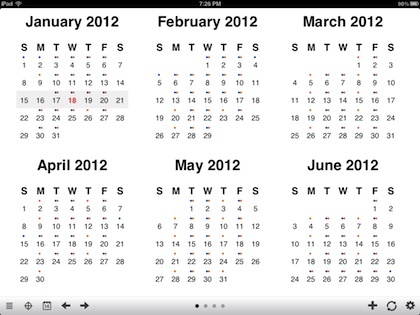 The arrows on the lower left corner of the screen allow you to move from day, week, month, year overviews. As well, the option to add a new appointment or adjust the views settings. Tapping an appointment offers more info and the option to edit. Switching to landscape, this is a view of the day, where the screen area allows to also see the week on the side. The dots along the bottom/center of the screen is how you move from day/week/month/year views when in landscape. The color dots reference which calendar the appointment is on so in our case we know which client group or internal without having to expand the view of the meeting details. This is the Agenda Calendar’s week view, very reminiscent of a print calendar book, again with the clean simple look to get to the info without cute clutter. Year view shows six months with color dots for quick reference to which calendar the meetings are on (work, personal… etc…). 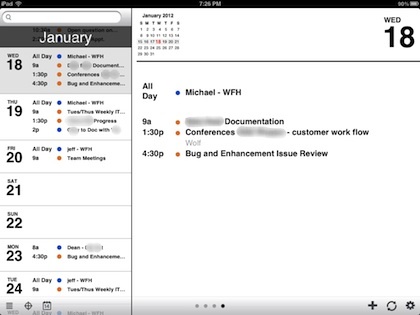 Agenda Calendar also offers a month view similar to a regular wall calendar where each day’s box has all of the meetings for the day shown at a glance. 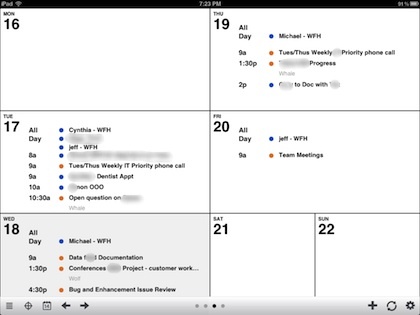 Agenda Calendar really does much more than just show your upcoming appointments in many views. From an appointment, you can also jump to a map, create a text message to the attendees and even start a call… the call is very handy when your expected on conference calls. There is also a ‘Goal’ view for iOS5 devices. Goals has to be turned on in the Settings area, which creates a new calendar. Place your yearly goals on that calendar so you can keep reminded of what you need to get done rather than waiting till December to try and install your sprinkler systems… not that anyone in our office keeps putting that project off since early last year!